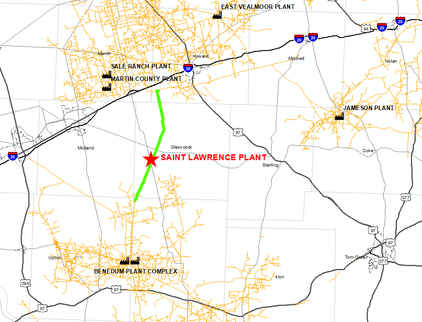 ​​​​​ ST. LAWRENCE, GLASSCOCK COUNTY – Midland-based WTG Gas Processing is building a cryogenic natural gas processing plant. The project, about 45 miles southeast of Midland, will be completed by subsidiary WTG South Permian Midstream. It will have a capacity of 200 million cubic feet per day. Delivery is set for third quarter 2019. Cryogenic processing facilities, or "stripping plants," collect natural gas from wells. The gas is cooled to sub-zero temperatures to condense natural-gas liquids, including butane, isobutane, ethane, and others from methane.